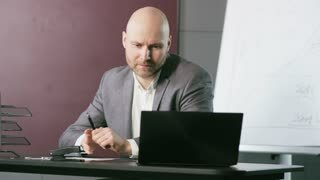 Middle-aged architect working on pc tablet. Manual worker using pc tablet and smiling, window city background. Serious foreman working on digital tablet. Mature architect using pc tablet. Thinking mature engineer. Mature engineer making calculations in tablet pc. Middle aged worker with blue ladder, blurred windows background. Mature woman chatting online using tablet pc. Middle-aged woman with tablet device. White isolated background.